Join the Barrio Bash 2018 #SweatChallenge! Want to experience how awesome sweatproof, natural makeup is AND share it with your friends and family? Well we want you to too! 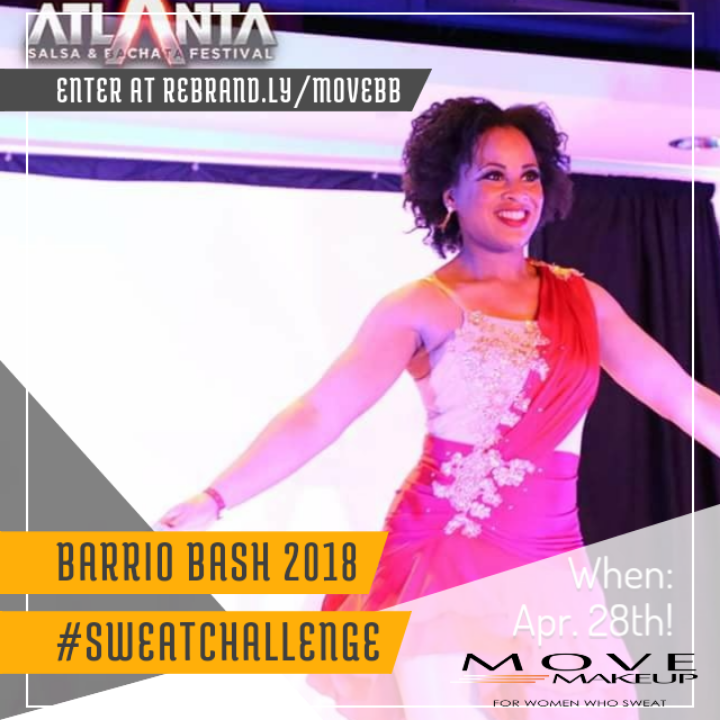 If you're going to be at the 2018 Barrio Bash in Atlanta on April 27th - 29th, now is your chance to try MOVE Makeup for free! We will be selecting a handful of lucky ladies (less than 5) to receive MOVE Makeup Sample Kits for testing out on Saturday during the workshops and parties. We want you to go full force, all in and put MOVE Makeup to the test! Apply it in the morning before you head out to the workshops and see how it does through your day of learning. Then apply it again that night and see just how well it holds up to a night of dancing. You will be amazed ;-). If selected, you'll receive your sample kit in the mail the week before the Barrio Bash. On Saturday, you'll apply your MOVE Makeup in the morning using the technique instructions and go about your workshop day. You'll post 3 photos throughout the morning/afternoon and do 1 FB live during that time. That evening, you'll do the same thing - post 3 photos throughout the evening, do 1 FB live, and find Leah to snap a few pictures with her. Trust us, it'll be fun and you'll be happy that you did it! SO HOW DO YOU WIN AND WHAT DO YOU WIN? Winning is easy! Whoever's photos have the most likes across her favorite public social media channel and Facebook will win. That lucky lady will win an exclusive Deluxe MOVE Makeup Essentials Kit that (includes our sweatproof foundation, concealer and eyeshadow plus a complimentary amazing finishing veil - $108 value) and a FREE Pair of Very Fine Shoes*! So don't delay - fill out your application today! Application period closes on Thursday April 19th!